Mindful Eating from the Dialectical Perspective is both a research reference and exhaustive guide to implementing a practice of mindful eating grounded in dialectical behavior therapy. This informative and timely new resource balances a presentation of empirical data with thorough and engaging instruction for hands-on application that features an innovative forbidden foods hierarchy construction. This invaluable guide makes the empirically supported approach accessible for therapists and anyone struggling with patterns of unbalanced eating. Angela Klein, PhD, earned her Ph.D. in clinical psychology from the University of Missouri, Columbia in 2009. Prior to this she began her study of eating disorders and psychology through the honors program at Kent State University, completing her B.A., with a minor in women’s studies, as valedictorian, in 2002. 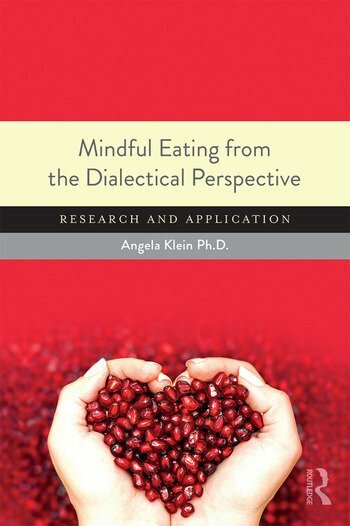 As both a researcher and practitioner, Dr. Angela has extensive experience delivering and conducting treatment trials emphasizing effectiveness in the real world, including her development and investigation of the mindful eating program presented in this book. Dr. Angela began specializing in dialectical behavior therapy (DBT) in 2004. She is also now actively engaged in radically open (RO) DBT, becoming one of the first intensively trained RO therapists in the U.S. in 2015. Her evidence-based approach retains perspectives from cognitive behavior therapy, balanced with Eastern wisdom. She has multiple journal publications in the field of eating disorders and has presented her research both nationally and internationally. She founded and directs her private practice, Centered Ground, providing individual therapy, family therapy, group skills training classes, and coaching support to adolescents and adults in the greater San Diego area, offering her expertise in DBT, RO, and mindful eating from the dialectical perspective.